For Aerosmith, the "Toys In The Attic" album, released in 1975, defined the band for the 70's. To this day it is often regarded as their best album. This album features 2 of the band's biggest hits of all time: "Sweet Emotion" and "Walk This Way". However, anyone who's heard this album in its entirety knows there's a great deal more where those two came from. There are quite a few good stories behind this album and its songs too. If you read Aerosmith's biography "Walk This Way" you'll see what I mean. Here are a couple of my favorite details: the title of the song "Walk This Way" was inspired from a classic scene in the comedic movie "Young Frankenstein" where Igor says "Walk this way..." and the other characters proceed to follow him... hunching their backs to walk like he does. Also, the original lyrics for "Walk This Way" were forgotten in a taxi cab by vocalist Steven Tyler on the day he went to the studio to record the song. The intriquing fact is that the version of the song we all know is composed of the lyrics he improvised in the studio that day. "Toys in the Attic" truly represents Aerosmith at their best in the 70's. As a creative team, this album was their most balanced effort from that era, with Tom Hamilton (bass) making significant writing contributions on several songs- including "Sweet Emotion" & "Walk This Way". Now, I encourage you to go out & listen to this album anew, and rediscover Aerosmith's best effort from the 70's. It's a bit coincidental that I'm reviewing Iced Earth in the dead of winter again. Right now the wind-chill temperature in my neck of the woods is about -20 to -30 F. Maybe I'll make a tradition out of it? Here's how I came by my newest Iced Earth addition to my music collection. 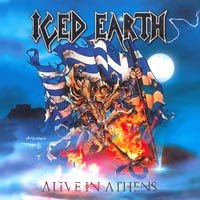 On my last shopping trip for myself before I began the holiday shopping rush this year, I happened to find another great deal at Half-Price Books; Iced Earth's 2-disc live album Alive In Athens. What an excellent find this one was, indeed. I had heard a few of the songs from this album on Iced Earth's best-of collection: The Blessed and the Damned. The quality of sound on these live recordings had set my hopes high for the full effect of the double-live album (unfortunately I wasn't lucky enough to find the version with a 3rd bonus disc). 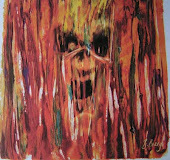 The album starts off with "Burning Times" the classic track from the Something Wicked This Way Comes album. This live album was recorded during the supporting tour. Throughout the entire 2-disc set, the band plays a very tight performance of Iced Earth's best songs. Many of the performances are so close to the versions recorded on the studio albums that if it weren't for the crowd noise and participation I might not have noticed it was a live recording. For me, this has always been an issue with live albums, where either the recording quality or lack-luster performance makes the listening experience less enjoyable. With Alive In Athens, this is not a problem. If you've ever wished live albums to sound closer to the original recordings, then this is a great album to listen to. After nearly 5 years, Metallica finally return with a new studio recording. And this time, even more so than with St. Anger, it is more than worth the wait. If the resurrection of their original lightning-bolt logo isn't enough to convince you that this band has finally begun writing music that lives up to their potential and their legacy, you need only listen to any random song from this album. So many elements of Metallica's classic style from the 80's are brought back into the fold with this album. Hammett's guitar solos are back, Ulrich's drums no longer ring like empty tin cans, Hetfield & Hammett display an endless tag-team of riffs and leads through almost every song. Clean guitar melodies give way to thrash riffs and vice versa over and over again. They even follow an old formula for the album's song sequence, with a long instrumental near the end, and one of the fastest songs to close the album (like they did in the days of "Ride the Lightning" & "Master of Puppets"). All-in-all, I just can't get enough of this album! All of these old habits that are brought back into play are making it easy for any reviewer to say that Metallica have "returned to their roots", or "finally recorded an album that could have followed..." (insert album of choice: Master of Puppets, ...And Justice for All, or "Black" album). 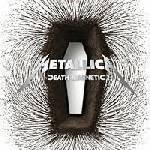 However, I feel like putting Death Magnetic into a present-tense context. To me it sounds more like they have still taken a step forward with their music, they just put on some old shoes to do it. Listening closely to the tone of the instruments, lyrics, and song structure, I can hear that it really is a follow-up to '03's St. Anger. Don't be discouraged though, every aspect of their music has improved drastically since St. Anger. There is no excuse for not listening to this album. True to the album's name, the concept of death is the underlying theme in most of the songs. With Hetfield's masterful lyric writing at its peak, the messages in each song are well developed. This album reminds us that life is short and we truly should seize the day while we can.